It’s only been 2 days since we set up this blog, and already D has gone crazy with the writings below. I figured it was probably about time I contributed somewhat to the effort and I thought the best place I could add value was in giving a bit of a breakdown on how we made the seedball machine and the costs/effort involved. We’d first seen a seedball making machine on youtube in a video which, sadly, I’ve not been able to find again. There are quite a few other videos out there but it was really the only one that showed how it had been made from start to finish, including the seedball scoop. I really liked the idea of a machine (especially after making 600 of the buggers by hand) and it seemed like a fun construction project. 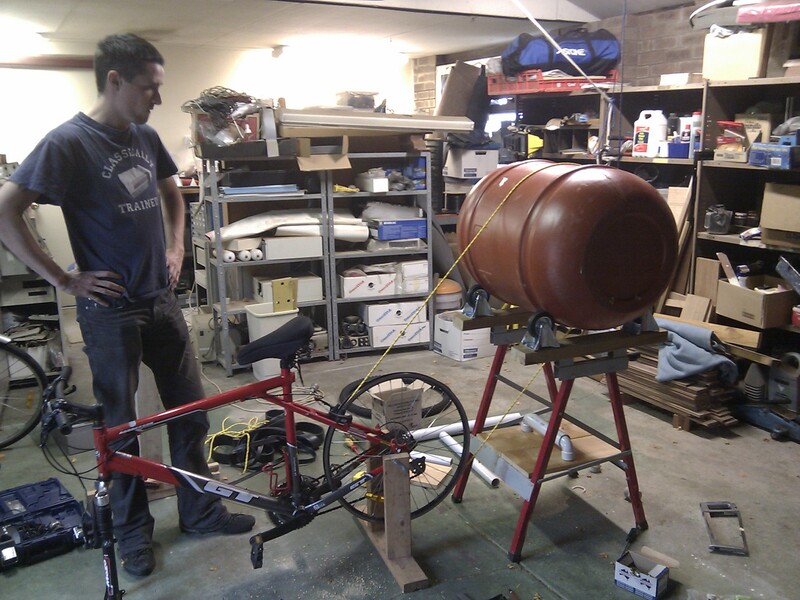 D seemed pretty keen on making a bicycle powered one after seeing the milkwood video and I also liked the idea of it being independent of power. Not to mention that anything that allows me to avoid mains power is probably a good thing. 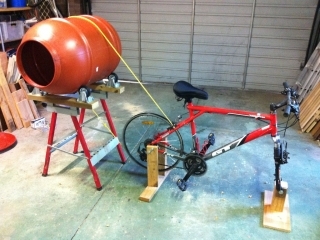 My thought was that the bicycle could easily be swapped out with a motor at a later date if we felt we wanted to do that. The core of the machine is an old olive barrel. It’s perfect in that it’s robust, large and already has a curving lip at the top and the bottom should you choose to cut these off. Ensuring that your mixture stays in the barrel with minimal fuss. It’s a 190 litre barrel and cost us $20 from a local person selling them off. The original design called for a frame of wood, kind of like a table with a opening in the top and a solid floor below the feet with a axle mounted on it. However while talking with D’s step-dad T, he mentioned that he had an old broken Bunnings saw-horse, cutting table…thing in the garage that might suit. It was perfect! It even folded down! I turned it upside down and removed the broken wooden support surface. I then screwed 2 lengths of wood longwise across the two legs. This was all flipped over and used as the base for the barrel. To this I added 4 x trolly wheels purchased at Bunnings. These were a little tricky to find in the maze of Bunnings and come in a variety of sizes, I ended up choosing 4 with a diameter of about 8-10 centimeters. This seemed large enough to give the barrel enough clearance to turn while still maintaining a good surface area contact. These were the most expensive part of the final design at $19 each, but you could probably use any second hand trolly wheels you can get your hands on. Do make sure to place your wheels and check that your barrel clears the wooden rails before attaching them, or there shall be embarrassment later. Also make sure that your wheels are aligned both side to side and longways or your barrel will sit crookedly and bounce/jostle while it turns. 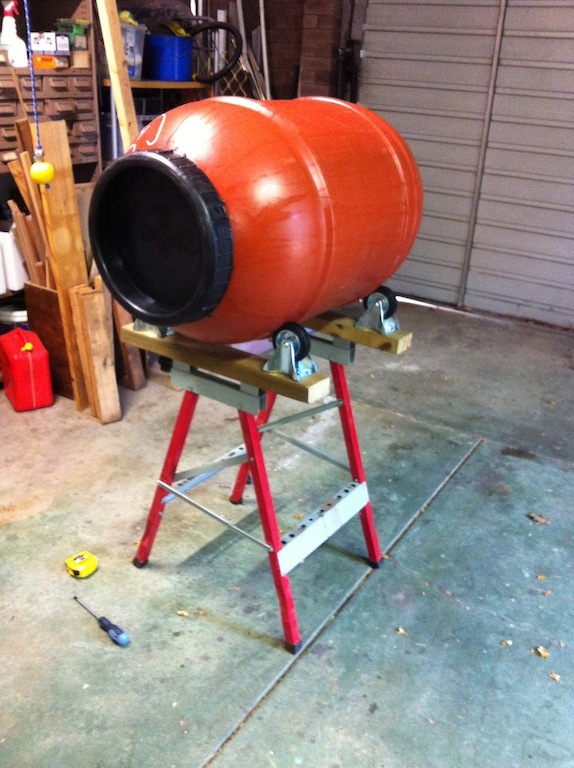 Here is a shot of what your creation should look like if all goes well.The barrel will turn easily and smoothly at this point with no jumping or sticking. Now to power it! 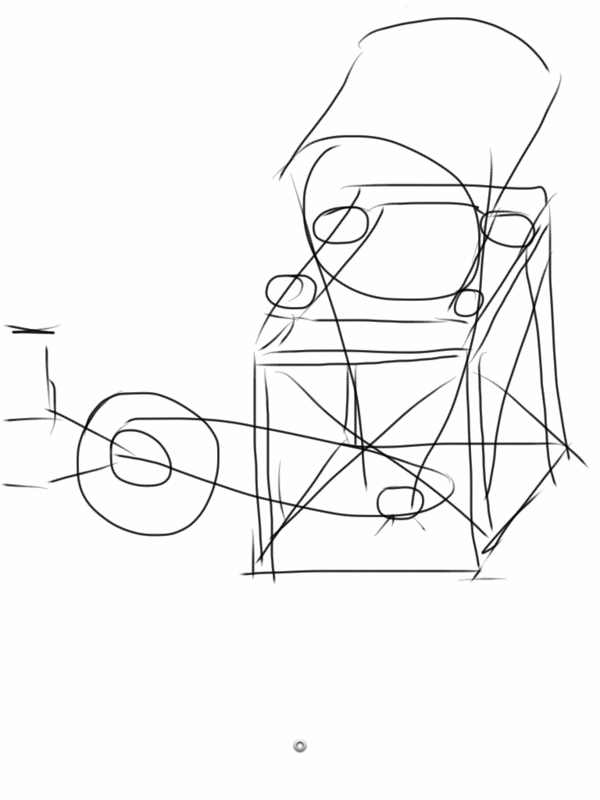 My original design called for an axle under the barrel that took a belt from axle to barrel, then a second belt from axle to power source to turn it. Once again T came to the rescue of my overcomplicated design and asked why we couldn’t just run a belt directly from the barrel to the wheel, given there was now a nice gap in the front of the “device” table. 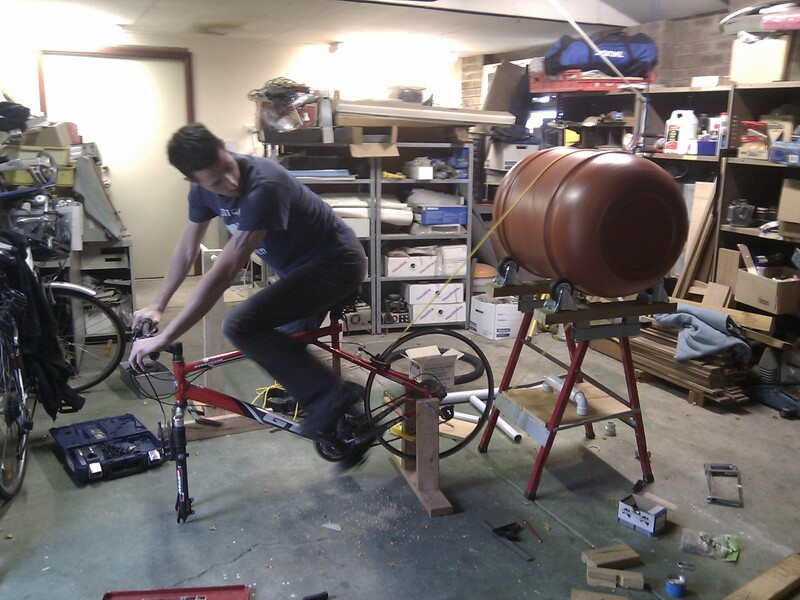 I agreed that this was a fine plan and we ran a test string from the bike directly to the barrel to see if it worked. In the picture to the right you can see the original thought for the axle (a PVC pipe with a looser PVC pipe over it) still in place. This was later removed. In order to run the string/belt we removed the rear tire of the bike so the string could fit in the groove where the tire normally goes. This worked well and seems to be impossible to get to “jump” out through abuse. In order to hold the bike in place we created a fairly simple rear wheel “hold-up-a-thinger” out of some scrap wood, nails and two D-nuts. A base line of wood (here a board that we had spare, but any flat piece should work) with two uprights measured for placement and angle to be just outside the rear horizontal swingarm of the bike. Sadly I have no close ups of this available but might add this later. 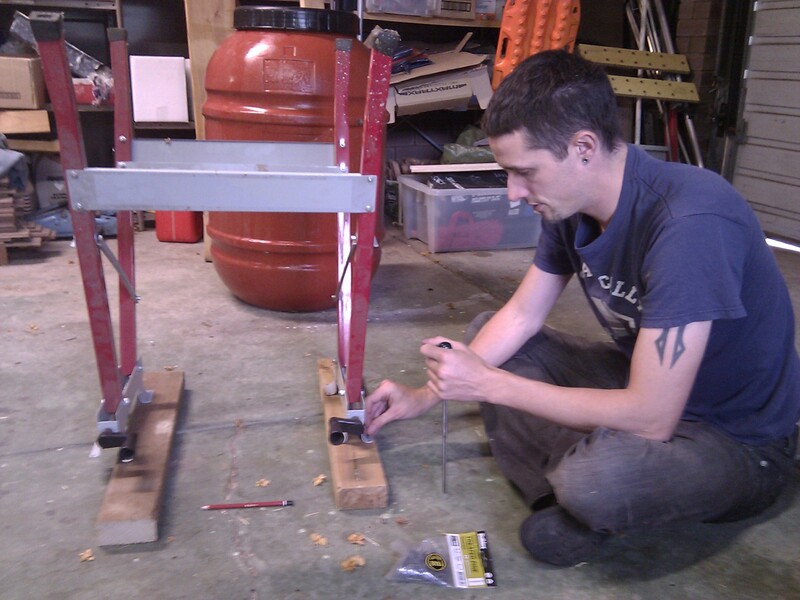 We then used two angled D bolts to go around the swingarm and through (outwards) the two uprights. Securing these in place with washers and nuts. Make sure your uprights are tall enough to hold the wheel a good 6-10 CM clear of the base board when bolted on. Next we used our test bit of string from the wheel to the barrel to give it a go: SUCCESS! The string actually worked surprisingly well. It was a slightly stretchy string, almost elastic, and very cheap from Bunnings. ($8 for 10 meters). It worked so well in fact that I, with much sadness, pushed aside the (rather expensive) rubber belt I had bought and decided to just stick with the string as the belt was quite wide and did not sit well in the bicycles wheel groove. After this there was just the business of getting the bike level and comfy to ride. For this we simply built an upside down “T” shape out of wood that just fit between the front forks of the bike with the wheel off. Next we drilled a hole right through the top of the post at the right height and ran a long bolt through it that would fit into the axle slots on the front fork. Finally we mounted the frot forks on this and added washers and a nut to clamp it down solidly. Viola! A finished seed ball machine. I’m looking forward to “giving it a spin” as it were. Total cost breakdown was as follows. 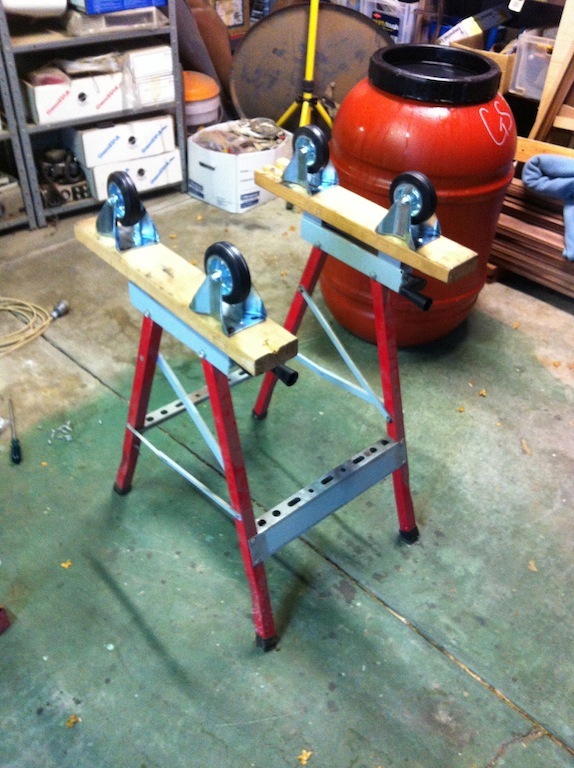 And you could easily get that down by using old trolly wheels on the base from somewhere. The only addition I intend on making to the machine so far is to get one of those “no slip” bath mats and wrap it around the barrel to give the rope a slightly better purchase. It works fine as it is but you have to accelerate up at a steady pace. It can sometimes slip if you put too much sudden power into it. I’m also considering a thicker rope, but it depends on how well the current one does.